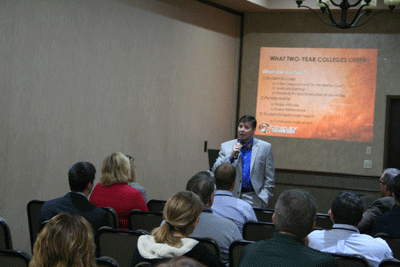 Cowley College president Dr. Dennis Rittle and Stephani Johns-Hines, associate vice president for Mulvane and online operations, served as presenters and panelists at the Regional Kansas Association of City/County Managers Conference held Thursday, Dec. 3 at the Best Western Holiday Manor in McPherson, KS. The conference meets every year in December, rotating around the state. This year there were nearly 140 in attendance, which included both city and county managers and administrators from around the state. Dr. Rittle said it was an honor to be joined at the conference by Johns-Hines and Dr. John Allison, Superintendent of Wichita Public Schools. “Being part of a dynamic exchange of ideas, perspectives, and thoughts with city and county managers from across the state developed greater cohesion and unified understandings between our respective agencies,” Dr. Rittle said. “Cowley Community College rightly understands its both timely and timeless role in stimulating and advancing economic development. Dr. Rittle shared with the city and county managers that public two-year colleges are highly attractive to businesses coming into any region of the state because of the ability to provide a trained workforce. In addition, public two-year colleges enrich a local community through otherwise unobtainable resources such as buildings and experts as well as through community events. Finally, the public two-year colleges are an incredible return on investment for their communities, often to the tune of 10:1 to as high as 20:1 with respect to dollars returned to the communities compared to local dollars invested.